I love spices! Whenever I'm out shopping, I always have to stop in the spice section to make sure there's nothing I need or to see if there's anything new on the shelf that needs to make its way to my kitchen. So, you can imagine my excitement when I was contacted by the Mystic Blue Spice Company and asked to review their spices. I thought it was quite fitting that A Well-Seasoned Life would review seasonings and spices. And, the company were generous enough to provide some spices for one of my lucky followers. The Mystic Blue Spice Company's products are all natural seasonings with no MSG, preservatives, or fillers. In addition to the herbs and spices, they also sell flavored sugars, dry rubs, and curry blends. Do you think you could find a use for chocolate sugar in your life? And, if you're a curry fan, you'll have no problem finding your preferred level of heat. I'll have to admit that I'm mild curry eater myself. My husband is all about the rub - Baby Cajun, Moroccan, and Mystic Montreal Style would all appeal to him. And, if you can't decide on one product - don't worry - there are gift sets, too. I tested the Southwest Seasoning blend which had ground chilies as its main ingredient. It smelled divine and looked gorgeous on my rack of ribs. ﻿I slathered the ribs in Mystic Blue Spice Company's Southwest Seasoning and placed them on the smoker for about five hours or so. 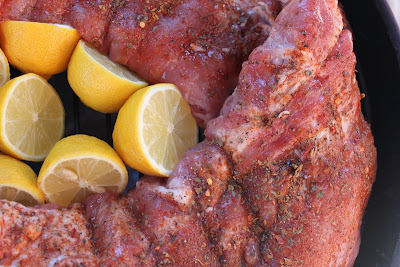 Since our smoker is round, I filled the middle with some lemons to prevent the ribs from drying out and to add some extra flavor. My husband was a happy man when this rack came off the smoker. ﻿The Southwest Seasoning worked well with pork. In the future, I plan to try it on some chicken fajitas. It's a versatile spice blend and its use is only limited by your imagination. Stay tuned for Part II when I use and review the Mystic Blue Spice Company's House Fish Seasoning. Are you as excited about it as I am? Would you like your very own jar of Southwest Seasoning? Then let me know by leaving a comment below and leave your e-mail address so that I can contact you if you're the winner. 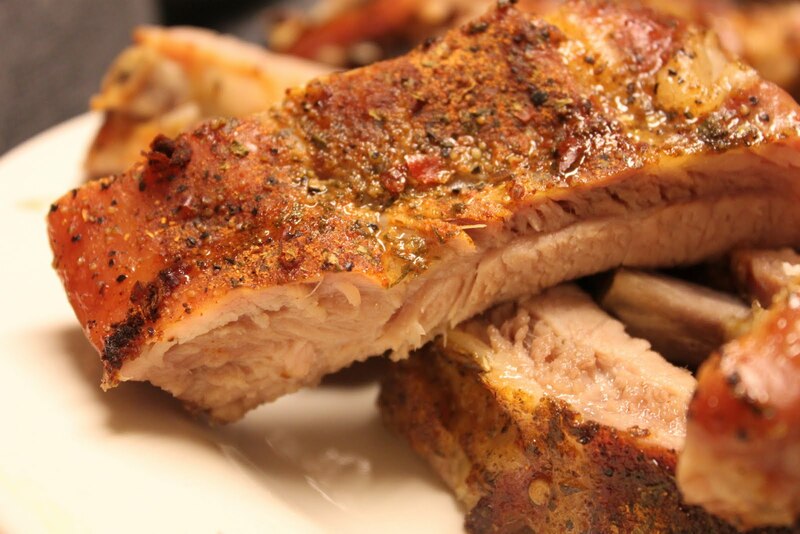 Mmmm, those ribs looks amazing!! 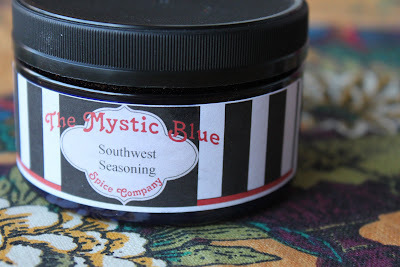 I'd love a chance to try Mystic Blue Spice Co spices!! OOOOO !!! Pick me to win!! YEAH, the website says NO MSG !!! that is great because I am allergic to MSG. The Southwest Seasoning sounds so good!!! 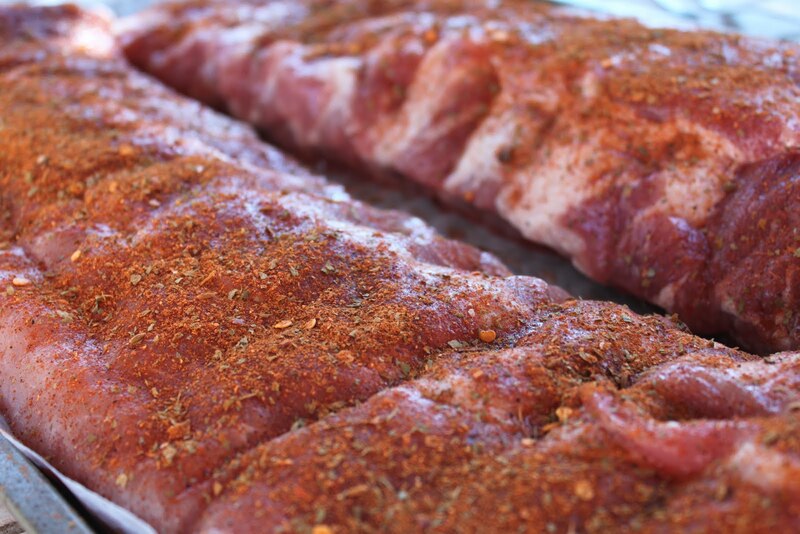 I would love to try the rub for ribs.. Ribs look delicious, I would love to win! Yummo! One day I'll get a smoker. Thanks for the opportunity to enter. I don't like to post my email online, but you can contact me via my blog if i should happen to be your giveaway winner. Thanks so much. I love to use spices for healthier eating! I love to use spices for healthy eating. I love using spices to make my recipes healthy and so delicious! Absolutely would I love to win. I am a seasoning freak and love to try all kinds. I would love to win a jar of this seasoning. I love cooking with usual and unusual spices. my go to meals are Italian and French. My sun-in-law loves to BBQ and tries all the rums he can. I.d love to try new ones. Yes I would love to win this, sounds awesome! Love your spices! Great product! Love this. Love to cook and bake. Count me in. I can't wait to try them on my ribs. That looks so yummy!!! I'd love to win this spice...We are always experimenting with new spices!